Are you stepping into your hopes and dreams? Emotional intelligence, among other things, includes the willingness and ability to try new things and to grow and change along with your desire for growth and change. Is there a dream or goal you’ve been putting off? If so, what’s stopping you? Can be all of the above!, but my secret answer lies here!!!! — keep reading! You have a neural pathway for every thought, feeling and action you’ve ever done. And the thoughts, feelings and actions that you’ve engaged most often have the strongest neural pathways. These are all inside your comfort zone. If you don’t do what it takes to get outside your comfort zone, you’ll always be who you always were, wondering, longing, not growing, staying stuck and frustrated that you didn’t make this dream happen. When you want to do something you haven’t done before — it could be building your business, ending or starting a new relationship, traveling around the world by yourself, or anything you haven’t done yet — by definition, it’s outside your comfort zone. And you don’t have the neural pathways for that, YET! That’s why most people think change is difficult. “YET” is an important word here, because we can always create, strengthen and train new neural pathways. You can create new neural pathways that represent the “you” that’s on the other side of your comfort zone, the “you” that’s ready to move forward towards your hopes and dreams, or a new way of “being.” These new neural pathways will light up the part of your brain that believes it’s already true, and they’ll light up the part of your brain that motivates you to take the actions necessary to make it a reality. You’ve grown your comfort zone, and increased your emotional range, flexibility and capacity to create what you want, to be who you want to “be” next. You’re able to embody the next version of you, and you have what it takes to step outside your comfort and into what’s next. And voila, change CAN be easy! 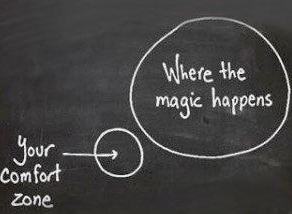 That’s where the magic happens. So true…. it’s an ongoing thing for entrepreneurs, each time we want to grow or change our business model! That means it’s always useful to know how to embody that “new you” when you’re ready. We all have our own versions of what’s holding us back. Finding out our own unique version is the first step. I’d love to talk with you about how to shift those blocks so you can create the new business you mention. Wishing you ease, peace and and joy along your way to great success!